With 3 systems interconnected, 21 installed, and as of today, 130 contracts signed (surpassing our goal of 100), with a few stragglers still coming in, Solarize Philly is now closed, and will reopen in early 2018. Happy Halloween! Installers will now complete installations and interconnections through the end of the year. 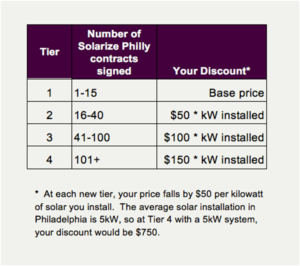 Working closely with a supportive team at PECO, the Office of Sustainability and the Department of Licenses and Inspections, Solarize Philly has streamlined the process of going solar in Philadelphia. Thank you to our installers for all their hard work (Solar States, Solar by KISS and Moore Energy) and to CED Greentech, our distribution partner. Now that we have reached the final tier in our group buying program, we’re excited to offer our customers the maximum discount. See below for details. 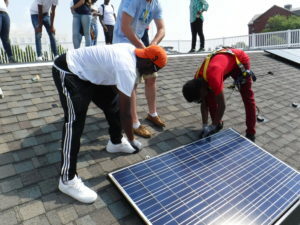 This phase of Solarize Philly will create 17 jobs, furthering our solar jobs training program and mission to create 10,000 jobs over 10 years. Though this phase of Solarize Philly has closed, we are excited to be working on Solar for All to increase access to solar PV systems for low- and moderate- income houses. To address the overwhelming interest in our program, there will be more opportunities to go solar with us in early 2018 – stay in touch to hear more!